Spring Break Nature Camp - Fun in the Sun! 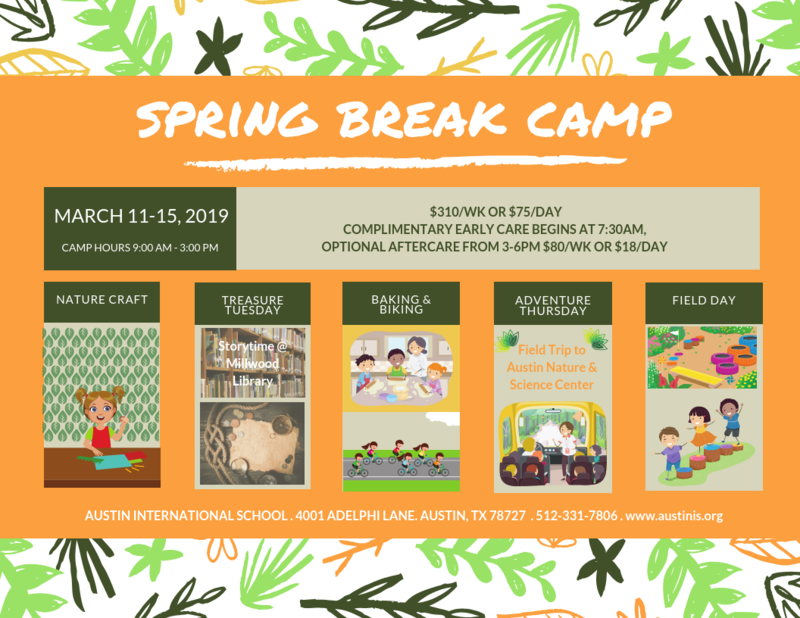 We hope your explorers can join us for a week of fun during our spring break camp. Campers will enjoy Nature Craft on Monday, Treasure Tuesday to search for treasures and titles at the library, Baking & Biking on Wednesday, for Adventure Thursday they will take a field trip to the Austin Nature & Science Center, and have a blast on Friday Field Day! The camp runs between 9 am - 3 pm and costs $310 for the full week or $75/day. Early drop-off is available at no charge and afternoon care is available until 6 pm for $18/day or $80/week. Register here and your camp will be added to your FACTS account. If you prefer to pay by check, you may email accounting or drop a check off at reception.